I always enjoy a Paige Toon book and this book was no exception. 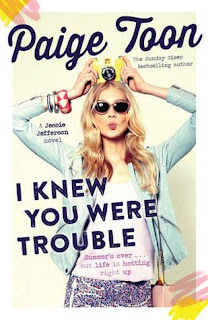 I knew you were trouble is the follow up to The Accidental Life of Jessie Jefferson and picks up where book one left off at the end of the summer Jessie spent with her long lost father rockstar Johnny Jefferson. After spending the summer in LA Jessie finds herself back to reality in the UK faced with the final year of high school, trying to fit in with her old friends and keeping her head below the radar in order to not alert the press to who she is. Inevitably the press find out about Jessie and she finds herself struggling to carry on as normal with her secret out and Jessie has to decide whether she is going to tough it out or embrace her new life completely. I really enjoyed seeing how Jessie's story develops over the course of the book. She isn't always the most likeable of characters but seeing her coming to terms with what it means to be the long lost daughter of a rockstar is really interesting. I liked the comments the story had about friendship and family and who you should trust with your secrets. All in all a story I really enjoyed. I am already looking forward to book three.